Home / Advice / Ceiling Fan Advice / What Ceiling Fan Size Do I Need? Many people think that main purpose of a ceiling fan is to keep the air in their homes cooler in the summer, and they don’t even think about using one in the winter. Many people also tend to get confused when they ask themselves what ceiling fan size do I need. We will delve later into that to answer that question. The main purpose of any ceiling fan is air circulation, and you should be using the ceiling fans in your home year-round. This is going to help you save a lot of money on your energy bills. When ceiling fans are running counterclockwise in the summer, they are moving cool air around, so it helps to cool the entire area without having to crank up the air conditioning. 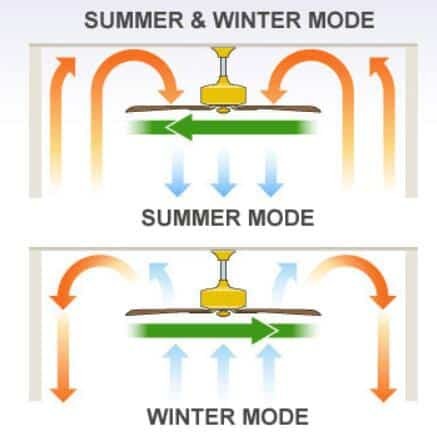 In the winter time, the ceiling fan should be reversed to a clockwise motion, which is going to push the warm air that rises back down so you will stay warmer and not need to turn up the heat as much. Before you go out and buy just any ceiling fan, you really do need to do your research. After all, not all ceiling fans are going to be right for all rooms. One of the main things that you need to consider is the size of the ceiling fan, and how to figure out the right size for the room you want to have it installed in. The first thing you need to consider is the room itself. Are you going to be using the ceiling fan in an interior room, or do you need one that is for outdoor spaces? If you need the latter, you will need to look for a ceiling fan that is rated for damp or wet locations, otherwise there is going to be problem with the electricity/water combination. Even with a fan that is rated for damp locations, it is not recommended that it come into contact with water. If it is going to be right outside, make sure it is rated for wet locations and not just damp ones. Now you need to take a look at the height of the ceiling. This is going to determine the type of mount you are going to be able to use. There are flush mounts that fit the fixture with the ceiling which is best for low ceilings, and then there are down-rod mounts that are better for higher ceilings. Let’s take a look at how the two different types of mounts work. Flush Mount – This is the best type of mount for rooms that have low ceilings, and you need a ceiling fan with a low profile. These are mounted flush with the ceiling, and there is no need for any extra attachments to use in the installation. Down-Rod Mount – This is the better option for rooms that have high ceilings, around eight feet or higher. Most ceiling fans come with a down-rod mount, so you don’t have to go out and buy anything extra in order to install yours. Here is a chart you can go by to get the right down-rod length when you are ready to start shopping for a new ceiling fan. Now that you have a pretty good idea of the size you need, and the type of mounting that is going to be required, there are a few other things that you need to consider before you make your final decision. These are mainly things like the style, color, light, etc. Let’s take a look at everything else that you need to think about before buying a new ceiling fan for your home. Blade Pitch – The pitch of the blade controls the amount of air that the blades can move. Most fans have comparable blade pitches, and the shape of the blade will have nothing to do with air circulation. Number of Blades – How many blades do you want your ceiling fan to have? They can come with as few as three blades, or as many as nine. Most people tend to choose traditional ceiling fans with four to five blades. Styles and Finishes – Your new ceiling fan should fit in with the décor of the room. There are hundreds of styles and colors to choose from. Most light shades are made of glass, although newer styles have fabric shades. Fans come in many different colors, and there are even styles that are specifically for kids’ rooms. Remote Control – Look for a ceiling fan that has a handheld remote control. This makes it easy to change the speed, reverse the direction, and turn it on and off without having to get up and reach for the pull. Other Accessories – There are other accessories that you may be interested in as well, including angled ceiling adapters, light kits, chandelier kits, and various types of pull chains. Hopefully we have answered your question, ‘’what ceiling fan size do I need’’. Before you go out and purchase a new ceiling fan, please be sure to take into consideration the size of the room, as well as the ceiling height. Measure the room that you plan to have the fan installed in, and then make sure that you keep the charts from this article with you so you are sure to get the right size fan.